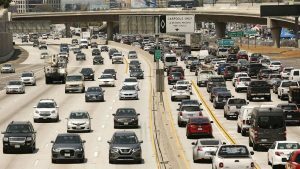 WASHINGTON, D.C. – Already-faltering negotiations between the Trump administration and California aimed at resolving a dispute over fuel-economy standards have broken down completely, the White House said Thursday. “The Trump administration has decided to discontinue discussions” with the California Air Resources Board about the Environmental Protection Agency’s plans to scale back the standards, the White House said in a statement. The board had been meeting sporadically with officials from the White House, EPA and the National Highway Traffic Safety Administration in hopes of persuading them not to roll back the Obama-era regulations. Both sides blamed the other for the breakdown in talks. California officials said the Trump administration’s efforts to reach a compromise were less than genuine. The end of the negotiations increases the likelihood that both sides will spend years fighting in the courts over car pollution standards. Under Trump, the EPA has said it is considering freezing the fuel-efficiency targets at 2020 levels. The EPA has also threatened to take away California’s unique authority to set its own, stricter air pollution standards for vehicles – something the state has been empowered to do since the enactment of the Clean Air Act in 1970. But the administration’s plans to undo federal fuel-efficiency targets won’t just affect California. More than a dozen states and the District of Columbia have adopted California’s rules. Together, they account for nearly 40 percent of all new vehicles sold in the U.S.
As a result of the administration’s decision to abandon negotiations, car makers could find themselves in a regulatory nightmare in which they have to produce different vehicles for a divided U.S. market – one class of cars that would meet the Trump administration’s scaled-back standard and cleaner vehicles for California and the states that follow its regulations. Although auto makers initially pushed the Trump administration to loosen standards, the aggressiveness of the administration’s planned rollback took them by surprise. Several have since made it clear they believe the proposal goes too far, but they have so far failed to persuade the EPA and Transportation Department to take a more moderate approach. The Alliance of Automobile Manufacturers, a lobbying group, released a statement Thursday saying that it supports “year-over-year improvements in fuel economy that align with the marketplace.” The group encouraged the Trump administration to find a way to maintain a single national standard. On Wednesday, as news outlets began publish reports that talks had ended, Sen. Thomas R. Carper (D-Del. ), the senior Democrat on the Environment and Public Works Committee, called on auto makers to pressure the Trump administration into returning to the negotiating table.